However, Perera was permitted to bat again because umpires were powerless to go against the wishes of Sri Lankan team management who wanted him to return, despite the advice given. 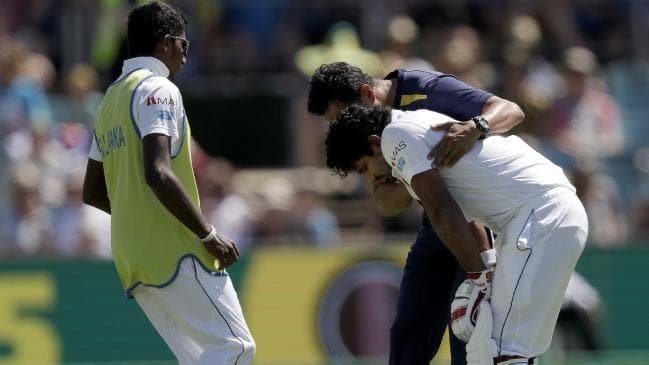 Sri Lanka, like many struggling cricket nations, don’t travel with a team doctor and there are no provisions for rulings by an independent medical professional or support in the rule book for concussion substitutes. Perera was out for a first-ball duck to Mitchell Starc in the second innings, but an Australian cricketer would never have been put in that position. When umpires were told of Dr Saw’s assessment, they replied that their hands were tied if Sri Lanka wanted Perera to return. Australian players were stunned he was allowed to bat again. It’s understood the ICC’s medical committee is examining the concussion issue and could issue guidance for how the issue will be handled in the future at a meeting later this year. The ICC recently completed a two-year concussion substitute trial for member nations, to which signing up was voluntary. Cricket Australia’s concussion guidelines and provisions for concussion substitutes in all top class men’s and women’s competitions have shone a light on the lack of urgency in the international game, which continues to leave cash-poor nations to make medical decisions without the authority of medical professionals. Australian women’s star Ash Gardner was ruled out of a recent WNCL game, after the toss had taken place and teams had been finalised, when she was hit in the head by a stray ball in warm-ups. Due to her history of head knocks, she was subbed out under CA’s concussion policy. Australian young gun Will Pucovski has been ruled out of domestic matches with concussion, Matthew Renshaw was ruled out of an Australian tour match against Pakistan last year, and former Test opener Chris Rogers twice missed Test matches due to Australia’s rules on concussion.